I've made some notes for me for the lace carriage, with pictures. Kitty, as always, is right on hand to help. Dont move the needles beyond the needle bed. 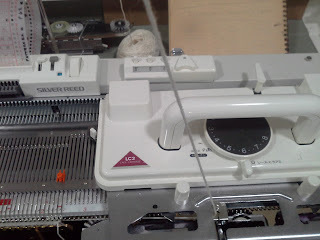 Use ravel cord to hold stitches, (this works really well). Use the lace carriage to do the stocking stitch. Yarn in the feeder, side levers forward and no punchard. It knits at a looser stitch than the main carriage. bring the white lever next to the card forward. on the carriage flick the side levers forward, and the dial to transfer. When ready to start, move both levers back and the centre dial down. Increase and decreases can be done as normal, just move the edge pins to their new position and take the needle out of work (for decreases). All the pins do is stop the carriage from doing anything. Just do your increase/decrease and move the edge pins. then knit. If there's a needle, it will knit, if not it doesn't, so it doesn't matter where the edge pins are, all they do is stop patterning. Just remember to move them and take the needle out of work. Also hold new ball under the feeder until it takes up. Make sure to pass BOTH edge pins AND the drums need to clear the punchcard assembly AND the row counter. Sometimes the edgepins moved and jammed under the carriage, push it back. Causes of jams are, the edgepins becomes dislodged, push it back. I got a little bag of them from Sunny Choi HKMK in Hong Kong.